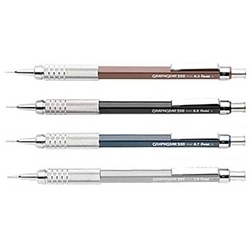 The GraphGear series offers students and professionals automatic drafting pencils for technical drawing and general writing. The 500 series has a metallic mesh grip on a slim, beveled barrel with a 4mm fixed sleeve. It is available in .3mm (bronze barrel), .5mm (black barrel), .7mm (blue barrel) and .9mm (silver barrel) points.